When garage door problems pop up, it's not the end of the world. You don't need to waste time since the most usual problems are obvious and garage door repair is simple when you have the equipment and follow the instructions of the manual closely. If you are prepared for the most common problems in advance, you can make them disappear quickly. One of the most usual problems is the sudden power-cuts. If your opener does not have a backup battery, it certainly has an emergency release cord but you need to read the instructions well to know the way it operates. It won't take you long and you will know exactly what to do in times the power is out. It's also simple to replace the battery of your remote controls. You just need to keep some extra batteries not only in the garage but in the car, too. Most wires are exposed and they can be easily ruined or chewed by animals. If the door doesn't work or the sensors are out of order, the wires may be disconnected or damaged. If the door moves in slow motion or has trouble moving, you need to check the possibility the garage door cables are loose and you must examine the condition of the chain driver opener. When the door closes without touching the ground, you must check whether there is an obstacle under the door or the movement of the rollers is obstructed. The above problems can be dealt with easily and without endangering your life. 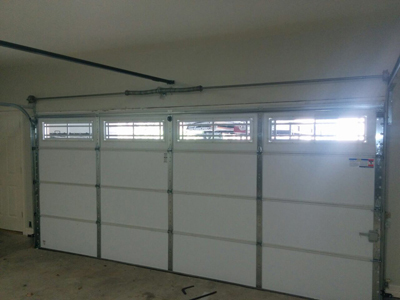 Though, broken springs or cables are serious tasks, which demand attention and good knowledge according to the experts of Garage Door Repair Holiday. Before you engage in such difficult tasks, you need to gather information about the right garage door service procedures and get properly prepared.